If you are anything like me you are still learning how to be an adult. At 30 years old I still don’t know everything that I probably should. I certainly know a lot (I can fix cars, motorcycles, I have built a house from the ground up, I was a cable television and internet installer, and dozens of other things) but not everything. As the saying goes, I am a jack of all trades but master of none. One thing that I never even considered was our washing machine. We were given a washer and dryer by my mother-in-law a few years ago. When we finally got the washer to our house in Maryland we found out that the drum had cracked in the move after I had hooked it up and it flooded our laundry room. We got another washer for free from a family that was moving away and couldn't take it with them. This one worked great. I never even thought about just how dirty it might be on the inside, especially down where you can't easily see. One of the very first things on the laundry ball's instructions is to clean you washer! Along with dirt, and mold/mildew, even laundry detergent itself leaves behind a residue buildup like you wouldn't imagine. So it turns out that our washing machine was a disgusting mess. You would be surprised at the nasty stuff that lurks inside your machine as well. The first step I took was to do a good soak to help to strip the chemicals and gunk from the machine. Set the washer for hot wash on the largest capacity setting. Turn machine on and as it is filling add one cup of bleach. This will help to kill any bacteria hiding deep in the machine. I left the lid open so that once it was full it would not continue through the washing cycle. While that was happened, I cleaned the visible surface area above the rim. Later, we'll be getting into corners. Let the machine soak for an hour. Then I closed the lid and allowed the full wash cycle to run. Once that is complete, you may want to run the machine once with plain hot water to completely rinse out any residual bleach. At this point, you will be switching to white vinegar, and it isn't a good idea to mix bleach and vinegar. Once the plain water cycle completes we are going to do another soak to begin stripping the set-in chemical residue from the machine. Just as before, set the machine to hot wash on the largest capacity. This time, as the machine begins to fill, add 2 cups of distilled white vinegar. I noticed almost immediately that the water had a strange color to it. It was a greenish-blue and extremely cloudy. The water here on Fort Irwin does have a high chlorine content but not this high. The vinegar started working almost as soon as it was introduced into the machine. What you are seeing here is the buildup of years’ worth of laundry detergent and whatever other chemicals you may use to keep your whites white and your colors bright. You will want to allow this water to sit and soak for at least 2 hours. I actually let mine sit until the water was room temperature. Then, close the lid and allow the washing cycle to complete. I was thoroughly amazed at the crap that came out of our washer. It was horrible-- embarrassing even! Once the wash cycle completes you will want to run another plain water cycle, again on hot and the largest capacity, but don’t add anything to the water. This will ensure a clean rinse. No soak is needed at this point. Once the rinse is complete its time to get down to the really nasty stuff. Our machine is a Maytag Performa. The following steps may be a little bit different with your machine but should still be mostly the same unless you have a front loader. 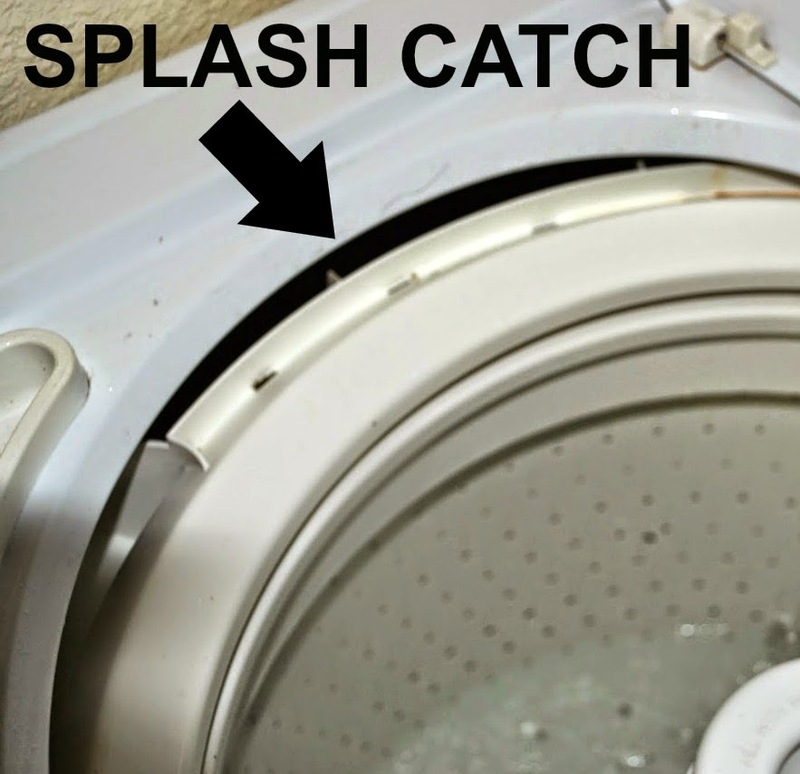 The first thing you will want to do is to clean around the splash catch on the drum. On most top loaders the drum will be able to rock from side to side. This helps the machine to balance itself during the spin cycle. Rock the drum to one side and look in the channel around the top of the drum. This was especially gross on our machine. The picture I took was actually done after it was cleaned because I had forgotten to take it as I was cleaning. But it will still give you an idea of what the splash catch will look like. I used a mixture of vinegar, baking soda, and hot water along with a sponge, dish brush, and q-tips to clean the groove. Once this is complete you will want to begin disassembling the agitator. For some readers it may seem like a rather daunting task but it was actually very easy to do. The agitator on our machine has a cup in the center for fabric softener. The cup will need to be removed in order to pull the agitator. On our machine, all you need to do is to turn the cup about a ¼ turn and it lifts right out. Once the cup is removed you will need to remove the bolt that holds the agitator in place. I didn’t have the proper tools on hand but with a little ingenuity was able to come up with something that worked. I used an angle-head socket wrench with a 4” extension to reach the bolt. Again, some of these pictures were taken as I was reassembling the machine because I had forgotten to take them as I was working. It was not even close to this clean as it was coming apart. My socket wrench was still not quite long enough so I stuck another wrench on the end of the socket wrench to be able to loosen the bolt. Once the bolt has been removed the agitator will lift out. It might be a little tough at first if it has never been cleaned as the gunk built up on the drive shaft will work like glue. Just wiggle it back and forth as you pull up and eventually it will come off. The picture below shows just how gross it was underneath the agitator. Seriously, this is what's going INTO your clothes! That, folks, is years of built up mold, mildew, chemical detergents and other nasty stuff. 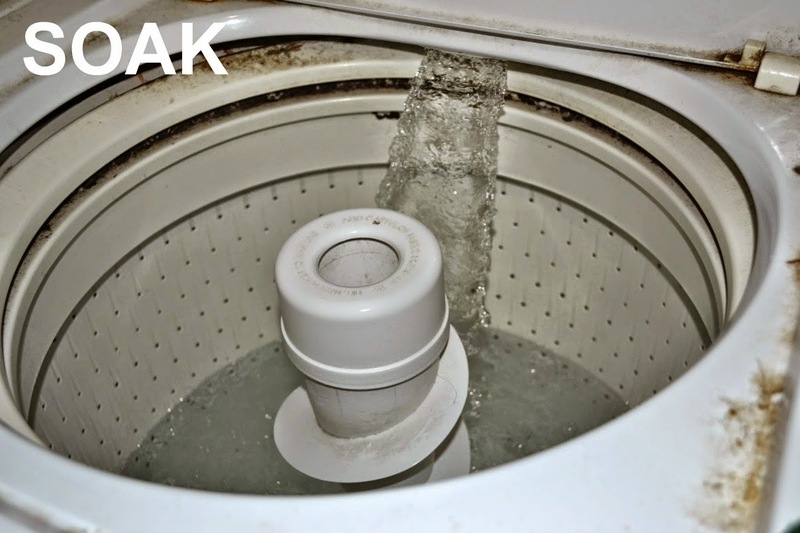 Now that the agitator has been pulled out you will want to clean it and the fabric softener cup thoroughly using the same mixture of hot water, vinegar, and baking soda mentioned earlier. Once you’ve finished cleaning the parts of the agitator its time to move on to the drum. 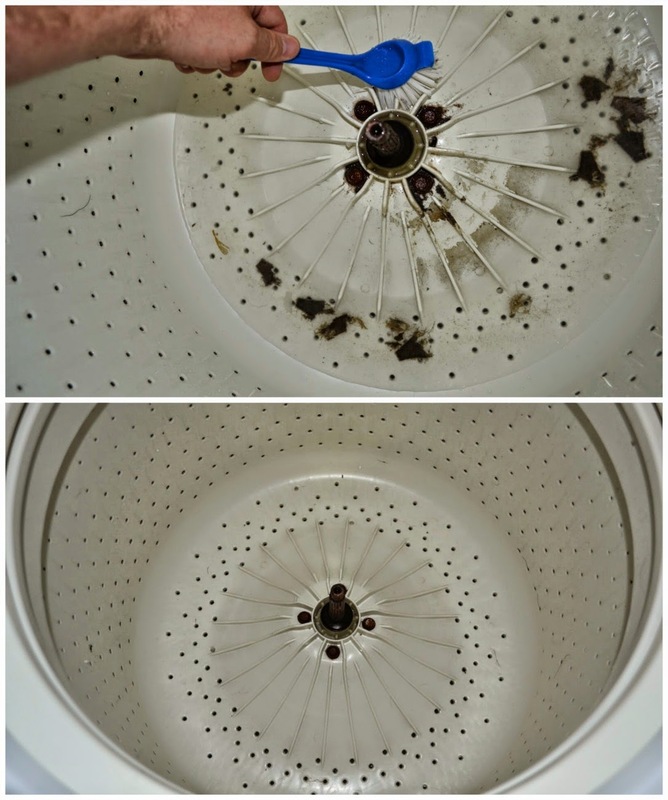 Again, use the same cleaning solution as before and just scrub the entire drum from top to bottom with the dish brush. All of that nasty stuff will begin to melt away as you clean. Once you have loosened up all the grime use a few paper towels to get that gunk out of there. After it has been wiped up close the lid and set the machine to rinse. Let both the rinse and spin cycles run. 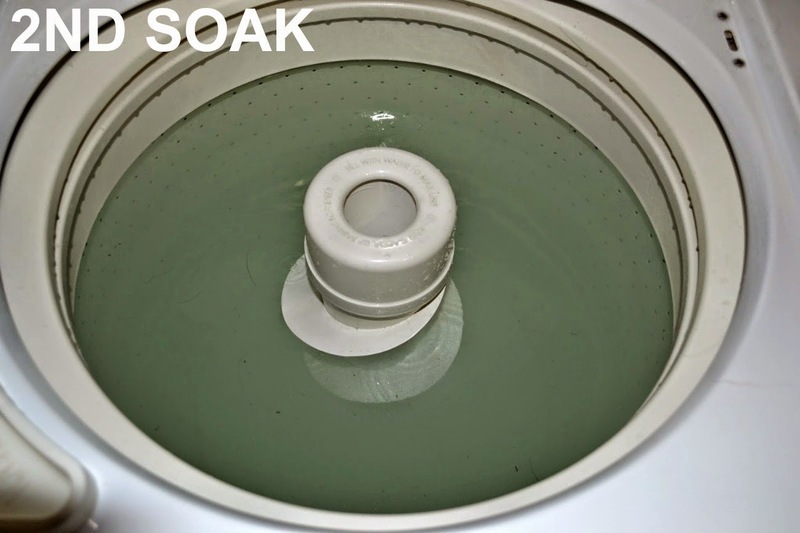 This will get out any grime that you weren’t able to wipe out and then drain the water from the drum. You may want to use a damp paper towel after the drum is empty to wipe up any remaining loose dirt. Now it’s time to get to the tedious detail work. Use the same cleaning solution and some q-tips to get the tight spaces around the hinges on the lid and such. Once you are finished we can put it all back together. Begin by replacing the agitator on top of the drive shaft. You may need to twist it back a forth a few times to get the splines on the shaft to line up with the grooves on the agitator. Once it has been lined up and seated replace the bolt that we removed earlier. Then replace the fabric softener cup. Fill the machine one last time with just hot water and let it run a full wash cycle. Now your washer should be nice and shiny again. Just like the day you got it (or better in our case)! Good luck, happy cleaning, and welcome to much more healthy laundry care! ~ Creative Collection Link Party, Dare to Share, Link Party Palooza, No-Rules Weekend, Saturday Sharefest, Say G'Day Saturday, Show and Tell Saturday, Simple Saturday, Simply Natural Saturday, Weekend Rewind. 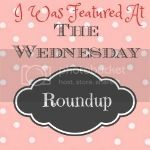 ~ Creative Style, DIY Inspired, DIY Showcase, Happiness is Homemade, Nifty Thrifty Sunday, Share Your Creativity, Silver Pennies Sunday, Submarine Sunday, Sunday Brunch, Think Pink Sunday. ~ A Round Tuit, Amaze Me Monday, Busy Monday, Clever Chicks Blog Hop, Craftastic Monday, Frugal Crafty Home, Homestead Barn Hop, Inspiration Monday, Mad Skills Monday, Making Your Home Sing Monday, Masterpiece Monday, Meandering Monday, Mix It Up Monday, Mommy Monday, Monday Funday, Mostly Homemade Mondays, Motivation Monday, Much Ado About Monday, Thank Goodness It's Monday. ~ Anti-Procrastination Tuesday, Backyard Farming Connection, Be Inspired, Brag About It, Create ~ Link ~ Inspire, Good Tips Tuesday, Handmade Tuesdays, Heart & Soul Hop, One Project At a Time, The Scoop, Share It Link Party, Share Your Stuff Tuesday, Show and Share, Take-A-Look Tuesday, Time To Sparkle, Tip Me Tuesday, Turn It Up Tuesday, Too Cute Tuesday, Totally Talented Tuesdays, Treasure Box Tuesday, Tuesdays With a Twist, Tutorial Tuesday, Two Cup Tuesday, You're Gonna Love It Tuesday. ~ Centerpiece Wednesday, Down Home Blog Hop, Fluster's Creative Muster, Fresh Foods Wednesday, From Dream to Reality, Hit Me With Your Best Shot, Homemaking Party, Inspiration Board, Mommy Club, Moonlight & Mason Jars, Penny Pinching Party, Project Parade, Show + Tell Wednesday, Wake Up Wednesday, Wednesday Round Up, Wednesday Whatsits, What Are You Doing Wednesday, What's It Wednesday, Whatever Goes Wednesday, Whimsy Wednesday, Wicked Awesome Wednesday, Wildcrafting Wednesday, Wine'd Down Wednesday, Wonderful Wednesday, Wonderfully Creative Wednesdays, Work It Wednesday, Works For Me Wednesday, Wow Me Wednesday, Wow Us Wednesday, Your Whims Wednesday. 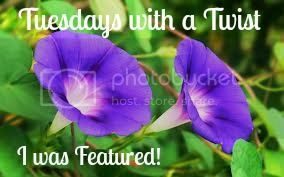 ~ Creative Ways Link Party, Home & Garden Thursday, HomeAcre Hop, It's A Party, Share Your Cup Thursday, Showcase Your Talent Thursday, Thrifty Thursday, Thursday Favorite Things, Time Travel Thursday. Wow, good to know! I also always leave the lid open on my washing machine when not in use, to allow it to dry. Thanks for this great information. Stopping by from Weekend Wind-Down. Wow! I shudder to even think what ours is like. We've had a hand-me-down washer for over eleven years and have never cleaned it. Looks like I have something else to add to my honey do list. Great tutorial! Now I need to look at my washer, I haven't taken the agitator off in years. Thanks. Good to know and thanks for sharing:) Never knew we had to clean our laundry machines! What a wonderful blog on the work horse in your home. Love the tutorial to clean your washing machine. 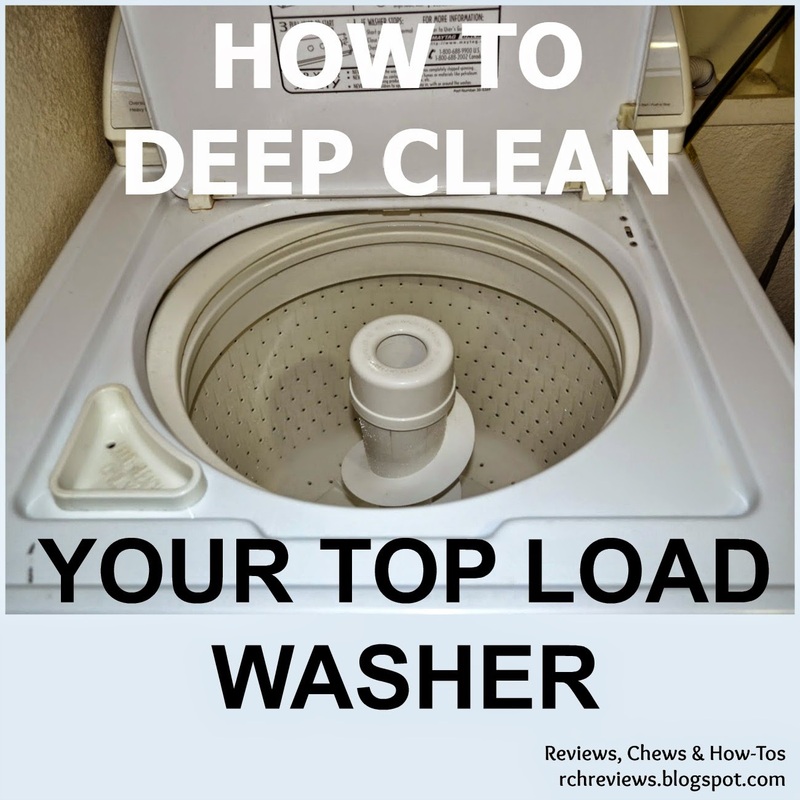 I have a high effeciency top loading washer and it is really difficult to clean as it doesn't fill all the way with water! Ugh! So, I have to leave the lip open and work a little different way! Thanks so much for this great information. I had no idea it was necessary to clean a washing machine, but I've been realizing that my first load of laundry each week brings about a bad odor...like stagnant water. Thank you so much for sharing this at Motivation Monday! Our washing machine had tons of grime thanks to using homemade laundry detergent for a period of time. Now I can keep the new one cleaner. Thanks for sharing via Mommy Monday, this is VERY helpful! 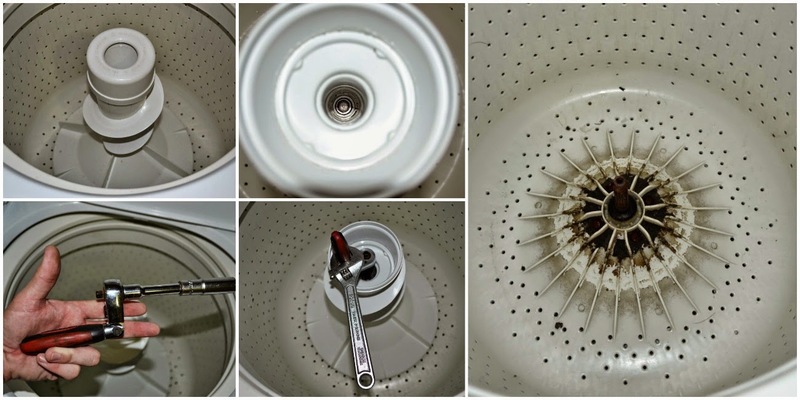 This is such an excellent way to give your washer a really thorough clean! Thank you for sharing with us at the Hearth and Soul hop. 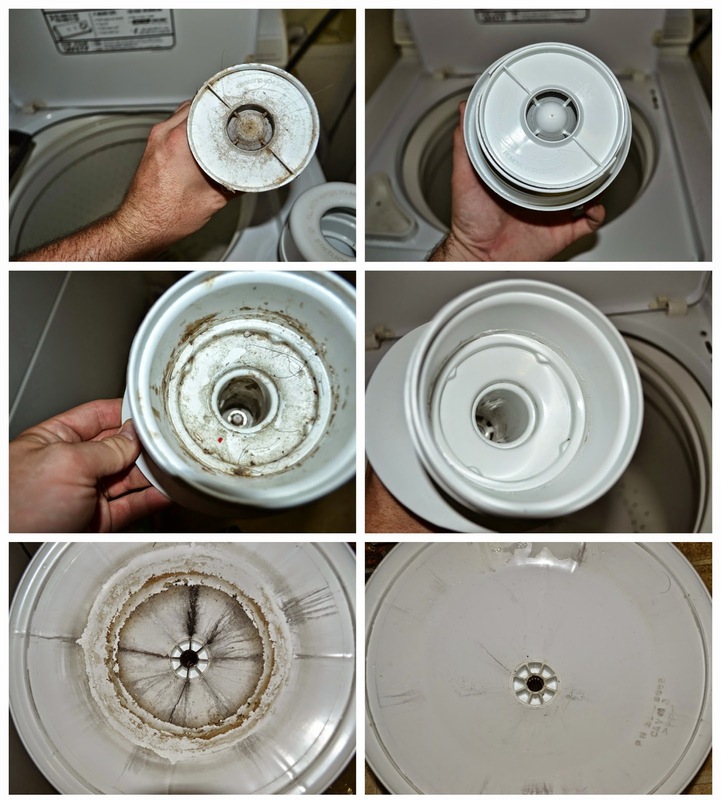 Great tips on cleaning your washer! Thanks for sharing with SYC. Thank you all for your kind words. I'm glad you enjoyed my entry. I hope this helps some of you to learn how to clean your machines and motivates those of you who didn't know just how gross it could be. I had no idea myself. I mean you are constantly running soap and stuff through it. Why/how could it be dirty. Boy was I wrong. I never imagined that the washing machine can be so dirty. Mine started to smell bad and I found tutorials how to remove bad smells but now i understood why it smells like that. Does there exist washing machine cleaner or any other tool? it'd be so useful. these tumble dryers are definitely not very clean. You did a great job, it is rare to find "how to" articles that go into such great detail.